Cannonball Run II is a 1984 American–Hong Kong comedy film starring Burt Reynolds and an all-star cast, released by Warner Bros. and Golden Harvest. Like the original Cannonball Run, it is a set around an illegal cross-country race. This was the last of the "formula" comedies for Reynolds. It also marked the final feature film appearances of Dean Martin and Frank Sinatra. Their appearances, coupled with those of Sammy Davis Jr. and Shirley MacLaine, marked the final on-screen appearance of the old Rat Pack team. The film also featured Jackie Chan in one of his first Hollywood roles. Having lost the first Cannonball Run race, Sheik Abdul ben Falafel (Jamie Farr) is ordered by his father (Ricardo Montalban) to go back to America and win another Cannonball Run in order to "emblazon the Falafel name as the fastest in the world." When Sheik Abdul points out that there is no Cannonball Run that year, his father simply tells him to "buy one." To make sure his ulcer does not prevent him from winning, the Sheik hires Doctor Nikolas Van Helsing (Jack Elam), who teamed with JJ (Burt Reynolds) and Victor (Dom DeLuise) in the first race as his in-car physician. Most of the participants from the first race are lured back, including JJ and Victor, who have taken jobs working with a flying stunt crew. In a subplot, Blake (Dean Martin) and Fenderbaum (Sammy Davis Jr.) are in financial trouble with Don Don Canneloni (Charles Nelson Reilly), who in turn is in financial trouble with mob enforcer Hymie Kaplan (Telly Savalas). After the Sheik manages to bail out Blake and Fenderbaum by handing one of Don Don's thugs a stack of cash, Don Don hatches a plot to kidnap the Sheik in an attempt to extort money from him. The race begins with JJ and Victor dressed as a US Army general and his driver, a private. They catch the attention of Betty (Marilu Henner) and Veronica (Shirley MacLaine), who are dressed as nuns for a musical, but remain in character and hitch a ride with JJ and Victor when they think the guys could become overnight millionaires. They do not lose their habits until later. Other racers include Mitsubishi engineer Jackie Chan, teamed with a giant behind the wheel (Richard Kiel) in a car—a Mitsubishi Starion—able to go under water. In a red Lamborghini (white at first) with "two great-looking chicks in it" (as the cops chasing them continually say) is the duo of Jill Rivers (Susan Anton) and Marcie Thatcher (Catherine Bach). Another team (Mel Tillis and Tony Danza) is accompanied by an orangutan, who at times appears to be the driver. They are pulled over at one point by traffic cops Tim Conway and Don Knotts. JJ and Victor stop along the way to help a stranded soldier, Homer Lyle (Jim Nabors). They also get much better acquainted with their passengers, Betty and Veronica, who change into something a little more comfortable. Don Don's enforcers (including Henry Silva and Godfather film actors Alex Rocco, Abe Vigoda and Michael V. Gazzo) continue to blunder along the way, with disastrous results. After Don Don's gang capture the Sheik, the racers band together to invade Don Don's "Pinto Ranch". JJ, Victor, and Fenderbaum infiltrate it in drag, dressed as belly dancers. Others barrel in by car and rescue the Sheik, who is reluctant to leave, since he has his pick of women there. The three "dancers" and Blake go to their Leader (Frank Sinatra) to seek help, only to have him jump into the race himself. In the end, the Sheik bankrolls Don Don's Ranch and then declares that he is upping the stakes to $2 million for the winner. All jump into their vehicles and make a dash for the finish line, avoiding traffic patrollers on the way. The Sheik, as it turns out, loses yet again, this time blaming the doctor who rode with him for injecting him with an unknown substance. But he convinces his father that he will win the return-trip race, having hired the winner of this one. It turns out to be the orangutan with a penchant for destructive behavior and giving elderly ladies the middle finger. Jaclyn Smith was originally meant to be the female lead but dropped out. "I think she was scared to death to be up there against Burt and Dom," said Needham later, claiming Smith was worried about his improvisational style. "I don't want someone on the set that's gonna be that scared. So we went somewhere else." She was replaced by Shirley Maclaine. Frank Sinatra agreed to do a cameo at the suggestion of Davis and Martin. Needham wrote three versions of the script for him - one where he could work a week, another where he did two days, and one where he could do his scene in a day. He picked the latter. He was paid $30,000 which he donated to charity. It was the first film he had made in three years and the first time he had reunited with Rat Pack members professionally or personally in three years. Needham says he turned up half an hour early and did his scene with minimal fuss. 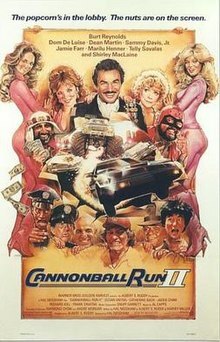 In North America, after the tenth highest 1984 opening weekend of US$8.3 million, Cannonball Run II slowed down, becoming the 32nd most popular 1984 film at the US and Canada box office with a total lifetime gross of US$28 million, less than half the takings of the first Cannonball Run. According to one review of the film, Cannonball Run II still turned a healthy profit, the reviewer attributing the film's financial success to preselling. The film had more success overseas. In Japan, it was the second highest-grossing foreign film of 1984 (along with Jackie Chan's Project A at number three), grossing ¥2.96 billion. In Germany (where it was the year's seventh highest-grossing film) and France, the film drew 3,748,167 box office admissions. The film had a total worldwide gross of US$56.3 million. Cannonball Run II was met with harsher reviews than its predecessor, with a 14% approval rating on Rotten Tomatoes based on reviews from 14 critics. Roger Ebert gave the film half a star out of four, calling it "one of the laziest insults to the intelligence of moviegoers that I can remember. Sheer arrogance made this picture." Ebert's co-host of the TV show At the Movies Gene Siskel also gave a harsh review of this film, calling it "a total ripoff, a deceptive film - that gives movies a bad name." Siskel even named it his least favorite film he had seen during his time doing At the Movies with Ebert. The film received eight Golden Raspberry Award nominations at the 1984 Golden Raspberry Awards, including Worst Picture, Worst Actor and Worst Actress. ^ a b "ジャッキーチェン映画の製作費と全世界興行成績まとめ". KungFu Tube (in Japanese). September 8, 2010. Retrieved November 30, 2018. ^ 'SIR' FRANK DROPS IN ON THE RAT PACK MARKFIELD, ALAN. Los Angeles Times 17 July 1983: r3. ^ "Cannonball Run II". Box Office Mojo. Retrieved December 23, 2014. ^ "1984年（1月～12月）". Eiren. Motion Picture Producers Association of Japan. Retrieved November 20, 2018. ^ "Cannonball Run II (1984)". JP's Box-Office. Retrieved November 28, 2018. ^ Ebert, Roger (1984-01-01). "Cannonball Run II". Chicago Sun-Times. Retrieved 2012-01-30. This page was last edited on 18 April 2019, at 07:04 (UTC).